Only one in a million would be able to realise his or her dream to journey to the roof of the world - or so, believed Kavitha and Pallu, young schoolgirls who dreamt of adventures that awaited outside their sleepy world in Hyderabad. Three decades later, when they finally reached the banks of the Manasarovar and climbed the slippery hills of Kailash, Kavitha Buggana, author of Walking in Clouds, was convinced that she had embarked on the journey of a lifetime. Kavitha’s debut book is on her journey, along with her cousin Pallavi, to the holiest sites of the Hindu and Buddhist religions, or to put it in her words, a place which is "more close to the sky than to the earth". The book takes the reader along the banks of the Manasarovar, weaving tales of deities of the Hindu pantheon in the hills of Kailash and the author’s close brush with death in the thin mountain air. 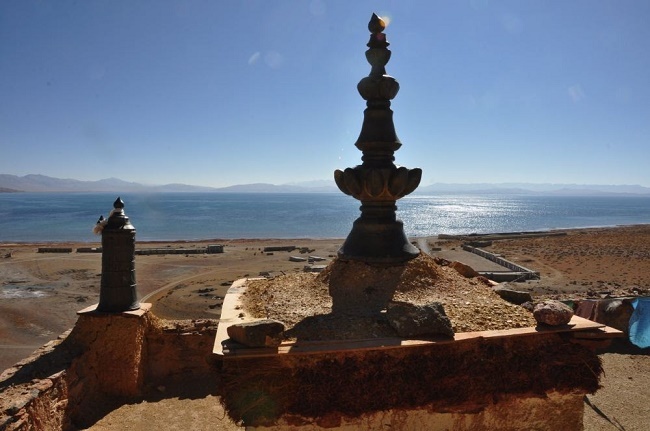 Kavitha’s fascination for the lake and the mountain grew strong after one of her close family friends narrated a personal account of his journey in the early '80s, when the route to Manasarovar was re-opened after long decades of the Indo-China war. “When the route was finally re-opened, there was a lot of buzz. With all the mythological stories we were fed from our growing up years surrounding Kailash and Manasarovar, the journey became a childhood fascination, an adventure to embark upon. The trip is still imprinted in our minds because it was the culmination of all our childhood dreams,” Kavitha exclaims. While Walking in Clouds is a travelogue that captures the beauty of the rivers and mountains in Nepal and Tibet, it also narrates tales of faith that bring thousands of tourists and pilgrims to the foothills of the mountains every year. Kavitha’s enchantment with Lord Shiva, Sati, Ravana and Rudra is apparent throughout her travelogue, although she is an atheist. There are snippets from the journey, which she calls a ‘parikrama’, where the author confronts death, and finds herself so close to the surreal world and yet is not there. 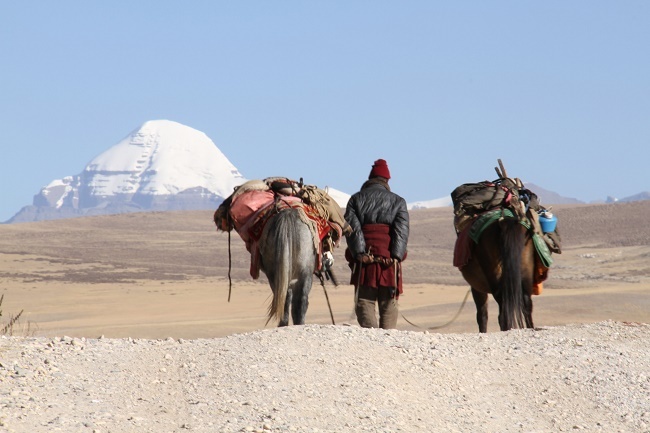 “We had dropped plans of visiting the Kailash twice before we finally embarked on the journey in 2011. There is a common belief among the elders in the family that to embark on a pilgrimage, you have to be called. Even though I didn’t consider it to be a pilgrimage, somewhere subconsciously I wished to believe that we weren’t ready for it yet,” says Kavitha. Kavitha, in her account, speaks of a blue light that radiated from the sky as she was waking up one morning, a light which she then believed to have emanated from the ‘Neelakantha’. When asked about the same, Kavitha laughs and says that it was probably only a result of altitude sickness and that she has listened to accounts of fellow travellers who experienced the same while on the mountains. Walking in Clouds is not only two women's extraordinary journey to the mountains, but rather an account where the author has captured every moment of surprise, shock and despair in detail. It also tells us the story of extraordinary camaraderie. Many chapters end with the 41-year-old and her cousin thinking to themselves while crawling into their sleeping bags, “How could we ever think we could do this?" “Not all the people who travelled with me were Hindus nor did they have belief in the Hindu scriptures. Faith does play a part in completing the journey but it's more about physical preparedness that takes you to the final point,” says Kavitha. Though the author was not able to complete the ‘parikrama’ and reach the final destination at Dolma La Pass, Kavitha says the journey helped her revive her childhood friendship and also taught lessons on gratitude and generosity. “My group consisted of people from around the world including Canada, China and Nepal. Until a few days ago, we were strangers but there was a time when we were stuck on a hill, it started raining and our flashlights died. We were trekking under the moonlight and there was a huge sense of panic. But it was the faith that we had on each other that helped us survive the night. And I never felt the journey was unsuccessful because these are life lessons that I carried back home,” Kavitha says. Currently working on a collection of fictional short stories, Kavitha says that she would like to go on an expedition for the second time, but not as a trekker but as a person who has the leisure of traversing the journey the way she wishes. “I never intended to write a travelogue during my journey to the Kailash but it’s the wealth of experience that made me pen down a book. If there is a next time, I would be on the banks of the river, physically and mentally stronger, able to capture the beauty of the mountains in their truest sense,” the author concludes.